The pico de gallo is a very popular typical Mexican salsa, that is accustom to serve in almost any traditional Mexican dish like quesadillas , molletes, burritos , etc. The simplicity and freshness of this salsa is part of the secret of its success . It consists in the combination of various raw ingredients that have touches that are acidic, spicy and even sweet. It is a salsa that almost resembles a salad. With a base of tomato, onion and chili; the combinations that can be made with other ingredients are almost limitless. This preparation introduces “the grapefruit" that is an ingredient that is rarely used in the Mexican cuisine that has a less sweet flavor than the orange, less acidic than the lime and with a slightly bitter touch. The flavor that is obtained is a whole experience. It is a perfect salsa for being daring and presenting it as accompaniment of a grilled steak or next to some snack or appetizer of your election. The preparation of this recipe can be considered for beginners. The grapefruit is going to be cut in a very fine way, we recommend using a small and sharp knife. We also recommend using red onion because it is crispier and it gives a more intense flavor to the salsa. 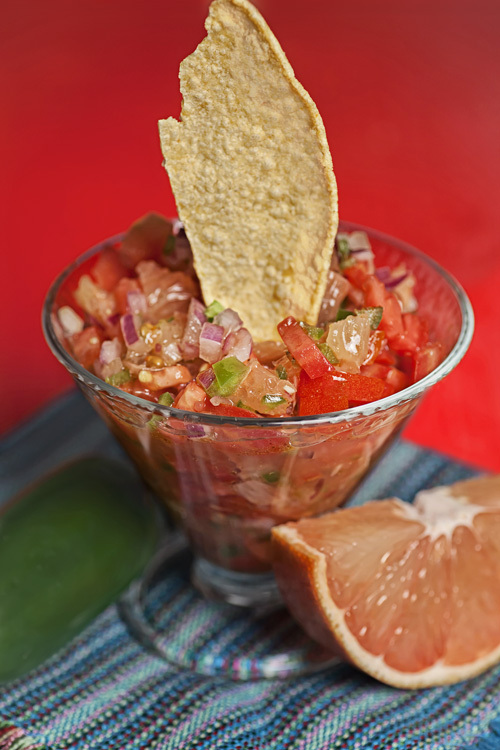 Use extra virgin olive oil in the preparation so the pico de gallo has a finer taste. In 15 minutes the pico de gallo will be ready. Dice 1/2 red onion and 1 tomato; upon completion put them in a bowl and reserve. Finely chop 1 jalapeno pepper, put it in the bowl and reserve. If you want a less spicy pico de gallo, remove the seeds and the veins of the jalapeno pepper. Peel 1 grapefruit, making sure of removing the pith, then separate the segments. Remove the skin and the seeds of the grapefruit segments that were separated. Cut into small chunks the grapefruit segments with the ones you worked and put them in the bowl with the other ingredients; then set aside. 3 tablespoons of Extra Virgin Olive Oil. Beat the bowl ingredients with a balloon whisk or with a fork, until they are well integrated. Pour the dressing that was beaten in the bowl over the other bowl, where the grapefruit pico de gallo is. Mix very well the grapefruit pico de gallo with a mixing spatula. Tip: Leave this salsa cooling for about 10 minutes so it will be fresher. Variation: Now taste the pico de gallo with another citrus flavor, with the mandarin’s flavor. Did you like the Grapefruit Pico de Gallo? These bowls are very good because they are very stable. Buy organic grapefruit so your salsa will have the best flavor. This knife is perfect to use it in the preparation of this recipe.